What does a man do when he turns 40 other than run a marathon and a half? Well If I had rich friends and/or relatives I would have encouraged them to buy me a flight on the only commercial zero gravity flights. I've been wanting to do one of these since I read about them many years ago and though the $3800 price tag is not cheap its cheaper than I seem to remember it costing a few years ago. Well I noticed that they had a flight running while I was in Florida and while the money isn't going to break me its more than I spent on my 1st car, more than a months mortgage payment and so it took me many months to convince myself to be this frivolous with my money - its just not in my nature. But I figured that I have no kids, I am very frugal most of the time and heck what else do I have to spend it on! So on Sunday 2th January I got up early and drove to Kennedy Space Center for an 8:30 appointment. The flight takes about 30 people at a time. When you arrive you are given a light carb laden breakfast becuase they have found that dairy and protein increase the chance of people being sick (its not called the vomit comet for nothing). They dress you in a cool flight suit with a name tag which is worn upside down until you have been through zero-g. Everyone is assigned to a team of 10 people and each team gets a flight coach. They recommend everyone takes motion sickness drugs to ensure a happy flight. Normally I don't need things but the thought of blowing $4k by chucking on the first parabola meant that had paid a visit to my doctor to get a prescription. Its an interesting doctor visit when you tell them you are not sick and demand drugs for such a venture - I think they thought I was crazy. Then we all all got to watch the 'safety' video. For the most part this is a marketing speech telling us about the 'zen like', 'life changing', 'transcendental experience' that we were about to have. They walked us through the 15 parabolas - 1 martian 1/3 gravity, 2 lunar 1/6 gravity and then 12 zero gravity trips. Each last about 30 seconds followed by a 30 second 1.8g climb. The 15 parabola are chosen becuase most people feel ill after 20 so this ensures a happy flight for everyone. They also have a couple of straight a level flights during the time to help with this issue and during the increased 1.8g part we are to lie on the floor and focus on a point on the ceiling - again to avoid any nausea. The rules are simple - no jumping (the roof is close to your head and you WILL hit it) and no swimming (it doesn't actually work). Finally we got warnings about hypoxia becuase the air masks are not in the roof like a commercial plane so if they depressurize there is an increased chance we wont get enough oxygen. They encourage us to visit the bathroom since the only toilets on the plane are ziploc bags full of gel "spaceman toilets"! The plane and company are associated with an airline and regulated by all the same FAA and TSA rules so we had to go through a TSA check and then we were onto the bus for a ride out to the Shuttle landing facility. This is a HUGE runway. After some pictures we enter the rather strange looking plane. From outside it looks like a normal plane but inside it is split into 4 sections. 3 padded areas - one for each team - and then enough seats for us all to sit on. One of the crew members has to walk us through the usual safety demo and we are off. It doesn't take long to get to our airspace and then we all take our positions with our team. I'm a little nervous at this point mainly becuase I have no idea what to expect. There really is no indication at first that anything is happening - you can hear the engines increase a little as the plane starts to climb but since there are no windows you have to real clue that anything is happening. Slowly you start to feel the increase in gravity as pressure across your whole body and if you try to lift your arms they really feel heavy. Its not uncomfortable but very odd but then quite quickly there is no pressure and you see people pushing off and WOW you feel very light. Martian and lunar gravity is strange enough but the first zero g is even weirder - you are suddenly not touching the floor and the slightest movement makes you go feet up or collide with your team mates. You can see why they say no jumping - you find yourself on the roof without even trying. After 30-40 seconds someone yells 'feet down' and you have to make sure your feet are closest to the floor. Gravity comes back quite quickly and you will hit the floor hard. This is why its padded. They have us do some fun things like chase M&Ms and play with water. Of course when gravity comes back you are showered with the spare M&Ms and loose water but that's all part of the fun. Before long the 15 drops are over and really its just not long enough - I had just about got some control and it was time to sit down and come back to Kennedy. As we deplane they turn our name tags over in our 'graduation' and take more pictures. So was it worth the money? Well I certainly had a lot of fun but its pretty hard to say it was $4k of fun other than the fact that you really can't do this for less money. I wouldn't go as far as they do and call it zen like or life changing but I would love to find a way to have another go. I suppose I had better start saving. Just because all the other kids are in school doesn't mean you can't save some money and go to Disney in January - its FAR more important for your kid to see Mickey than get an education and you can annoy all the adults who thought that January might be fairly kid free. Make sure to keep your 5 year old up till 10pm - its VERY important that they see the fireworks and that YOUR vacation isn't spoiled. Sure they may cry all the way home on the bus and annoy the adults but at least you got that picture with Donald. If you kid hates rides with water and/or drops then use aversion therapy and make them ride it. The other folk in the boat love hearing him scream all the way round. Once your kid is over 14 you can let them run around the park on their own with their friends and push into all the lines - think of it as an example of how well you parented for the last 14 years. When you are in a busy resturant use the table next to you for storage so that nobody else can sit there. Instead of standing in line just send dad to stand in it while you go to the restroom, eat some food, go on other rides - then at the last minute your entire party can push their way to the front. Before all the parents out there chime in I should say that a lot of parents do manage their kids well... but there are just too many people out there that don't. Don't walk in a straight line - if you weave about it will increase the amount of walking you do. If you have spoiled kids then remember the whole park is there just for their entertainment - all the other people are insignificant. If you can get your family to the front of the line by getting someone old or over weight a rascal scooter then do it. It doesn't matter if their are 20 people in your party and you can walk to the ice cream shop when nobody is looking. If you get grandpa a rascal scooter then don't bother checking if they took his license away for reckless driving - all the other folk will think he's cute when he reverses into Mickey Mouse. Yesterday I did something crazy so its only fair that today my body gets to pay me back. However thankfully it appears to have taken pity on me. After the race I came back and took the obligatory ice bath - that's 4 in 3 days! Walking has not been too bad. Going down stairs is slightly painful though which is tough on the Disney buses. Last night we all went to downtown Disney and walked around for about an hour. All the runners appear to be doing very well but toward the end of the evening I was getting a little sore. My foot injury from December survived the race but is aching a little just to remind me that it wasn't QUITE better and I need to stop running on it for a while. I am giving it ice packs whenever I can and taking Ibuprofen. Slept really well - no surprise after 2 early days and 39.3 miles. Today I went for a bit of a swim and walked around the hotel. In the afternoon we went to Magic Kingdom for a few hours and it was about half an hour too long I think. By 7pm my foot wasn't happy but I was good enough to walk over to meet my friends for the celebratory dinner. The sit down was enough to get my foot recovered and hobble back to the bus for the hotel. All in all I think I'm doing pretty well after what I put my body thought. Some more ice on the foot seemed to calm that down and I am off to bed for final sleep deprivation recovery. Fingers crossed that all will be well on Tuesday and I can enjoy more of Disney world. When we left our hero he was feeling pretty darn good for having run a half marathon after getting up at 3am. When the alarm went off at 3am today (Sunday) I was feeling really good. J walked me to the bus stop at 3:30 and I headed off to the start line for the second time in 2 days. Today there was 18,000 people entered though I often wonder how many people have dropped out since my little group had 5 entries between us and only 2 at the start line for various reasons. The race doesn't start till 6am so once again there is a LOT of waiting around and visiting the porta potties. At 3am its already a little warmer than I like to run a race in so I am thinking that its going to be another day of cold showers at the water stops. At 4:45 when we walk to the start line its not got any warmer but I can feel lots of the humidity which is something else a Seattle runner is not used to. At 5am I am sitting on my throwaway T-Shirt just waiting which is very boring as I have nobody to talk to today. Eventually the time ticks down and the fireworks go off and we are away. This morning I appeared to have messed up my water consumption and I am now bursting. I hope to get to the first bathrooms but after half a mile its pretty obvious that is not going to happen so I join the other hundred guys (and a couple of girls) by the trees. Ahhhhh that's better now I can concentrate on the race. My legs don't feel as fresh as normal but I am still feeling pretty good. I start out at around 10:50 pace and decide to hold this for the first loop which is about 4 miles. We loop around Epcot passing the 25 mile marker and head back up the start line - the 4:30 pace maker passes me and I decide to not go with them. 4:30 would be a good time but I need to start out slowly - If I feel good later I will try to catch up. Its a little crowded in places and some late wheel chair runners have to force their way through the crowd - they are not going to have a fast race today. At mile 4 I'm still feeling good and I keep the 10:50 pace for a couple more miles. Mile 6 is just before the Magic Kingdom and my legs are good so I speed up a little and try to reach half way at an average 10:30 pace. My cool watch slowly tracks my pace down and after a run up a crowded main street and under the princess castle all seems to be going well. I see Woody and stop to get my photo taken - Woody is VERY excited that it says Andy on my shirt as you can imagine! As we leave the magic kingdom I hit the half way point at almost a perfect pace. My legs feel a little tired but hey I did just run a second half marathon so I'm not too worried. But the fatigue continues and I notice my legs are starting to feel heavy and as I pass mile 14 and 15 I notice my pace is dropping. I try to keep it up but getting to 16 was as hard as mile 20 is on a normal marathon. In the last 20 minutes or so my legs have gone from good to tired to fatigued and I still have 10 more miles and 2 hours to go. The run between Magic Kingdom and animal world is pretty boring - very little to distract you and its hard to keep going. I'm very glad of the water stops where I can rest my legs for a minute or so and its tough to restart after each one. Just before animal kingdom I see the Disney greenhouses - it takes a lot of plants to keep all the parks looking nice I guess. And then into the park - finally something to distract me. There's quite a few characters here so I stop (the rest is a bonus) for more photos. Its hard to tell how well I am doing - there are lots of people going faster but lots walking too. My watch is slowly moving my average pace back towards 10:50 pace and by my calculations that's heading towards a 5 hour marathon. It doesn't take me long to convince myself that 5 hours is a perfectly good time for the goofy. We leave AK and my legs are just wiped... I'm still moving reasonably well just more slowly and with with some bonus walk breaks. I have to stop to remove something from my shoe and bending down to retie it is not fun. We head out to mile 20 and 21 and its really getting warm. Thankfully the water stops are very frequent so I get to cool off and have lots of walk breaks. Its taking a lot of will power to restart the legs and I wonder who's stupid idea it was to do this - and you know there is only one person to blame. Thankfully I know my crew are just 6 miles away and there is an extra medal on the table. The pace continues to slow toward an 11:00 pace. I discover BioFreeze and liberally rub it in places that it may not have been designed to go. We hit the MGM Studios park (though seems its been rebranded to Hollywood Studios) - they are handing out candy - and we all know Andy likes candy. MGM has several characters out so I stop for a photo with all of them. I am SO grateful for an excuse to pause. The most annoying thing is that I don't feel tired as such, I have no real aches or pains just that my legs feel so heavy and don't want to move. Mile 23 takes forever as does mile 24 but I have seen mile 25 before and I get a little second wind on the way there. My average pace is over 11 minute miles now but I convince myself I will run the last 1.2 miles to ensure sub 5:00. BUT.... mile 25 appears to be about 6 miles long. Its around the lake at Epcot and even though I can smell the finish line I have to take numerous walk breaks. I give myself a count of 10 at each one and then push myself to run. There are lots of people here all calling my name - usually just as I start walking. Eventually I hear the gospel choir who were just before the finish line at the half marathon. I take my last 10 second walk break and round the corner looking like I ran the whole way ;-) I can hear the cowbells and spot the crew cheering and find some energy to cross the finish line at a good pace. 4:56:14 - a way off my 4:30 'best guess' but under 5 hours. Apparently its over 80 as I finish and the heat alone means a slower time. But I don't really care - this race was really about finishing. Well I know those of you on the west coast are probably not even out of bed and some of us have already run a half marathon!!! When you left the thrilling epistle last night the hero (and heroine) had just had the traditional 'night before the race cold bath' and were trying to get to sleep. I think I may have dropped off sometime after 1 so 1-2 hours sleep before the alarm went off. it didn't help that we appear to have the room next to some incontinent folk - I have never heard a toilet flush so much! Maybe they were very nervous about the race eh? So 3am calls/bleeps/buzzes and though I am not a morning person I am always annoyingly perky on race day. It took me about 5 minutes to wake up then we dressed and ate breakfast #1. This is my 5th half marathon and J's first so while I was casual and chatty she was..... well lets just say not as casual and chatty and I am probably quite annoying. We went and caught the bus at 3:30 which was about 5 minutes before the big line appeared and headed of to the start line. There are 16,500 people running the half so we had little chance of meeting our other friend but after a quick toilet stop there he was right in front of us. The force is strong with us today! The area got more and more crowded as people arrived and around 5am they called for the first wave which meant we had to leave J waiting - first time runners always get the final wave which is pretty sucky if you are a reasonable runner because you have to dodge all the walkers. My corral is B - right behind the elite and fast runners in A. (they go up to F for the 1st wave). We have to stand around which is pretty annoying and it is very humid and feels way hotter than the 64F they were claiming. The really funny thing is when the announcer apologises to people for the cold - I was already in my single layer and my hat was destined to last less than 2 miles. My race tactic was to run at 10:30 pace as much as possible and if I felt tired slow down toward the end and aim for 2:20 to 2:30 finish time. My PR is 1:58 so that's a nice slow half marathon while saving something for tomorrow. J bought me a new fangled watch for Christmas that has a virtual partner mode where you tell it that you want to run against someone of a certain pace and it just tells you how far behind/in front of that person you are. Its very easy to read and you don't have to do any math. So my partner and I headed out at 10:30 into the muggy morning - its still dark at this point of course. First water stop - too hot... drink the powerade and dump the water over my head. This was the routine at every water break. Support was excellent all around the route but especially as we head into magic kingdom. Lots of Disney characters were out and i took some pictures as I ran with one of those disposable cameras and even found time to stop and have my picture taken with Jessie from Toy Story 2. I'm not trying for a fast time here so I can enjoy the sights and high five the kids and cast members who are wearing Mickey Hands. The middle part of the race has a nice breeze which cools things down a bit. Before you know it you exit magic kingdom and run through the back lot which is cool because there are bits of rides and castle and stuff just piles up in a warehouse. Then we are at mile 8 or so and on the way back. My average pace is right on 10:30 and I feel a little tired but nothing like usual. I think I am pretty safe at this pace so I just keep it up even though I am being passed a lot. Of course I am also passing all those people who went out way too fast and are now walking. Pretty soon the spaceship earth globe comes into view and we are heading into Epcot. Its mile 11 now and I have plenty of energy. My watch tells me I am 100ft ahead of my virtual partner so no speeding up for me. Those just running one day are picking it up now and its VERY hard not to go with them. The sun is out now and its warming up so I don't want to wipe myself out. Even at the finish line there is no sprinting - I don't need to pull any muscles so I just casually jog it in along side people wheezing. My final time is a nice sensible 2:18 There's a couple of older guys who finish near me who are not looking good but the medics grab them and I go get my space blanket, medal and food and head off to meet the supporter crew. I cant find them at first so I go join the character photo lines and get some photos - well i can choose to buy them for the small price of a kidney or my soul! My other goofy friend comes in 10 minutes or so behind me and we head off to see J finish her first - it takes about 10 minutes to get close to the finish line and we elbow a few folk out of the way and ring the cowbell loud as she finished and was still smiling for 3:05. She's even walking almost normally. Of course now its back to the hotel room for yet another ice bath (my second of 4 this weekend) and now all I have to do is rest and eat and get up at 3am again tomorrow. Woo Hoo. Everything feels pretty good so the start should be nice. We will see where the fatigue kicks in though. On a marathon its usually around mile 18-20 so I'm expecting something a little earlier tomorrow. Well I just got out of 15 minutes in a bath with actual ice in it! Yes Coach REAL ICE! The cold water in the hotel is tepid at best - so after a few minutes in that J decided it needed something extra. After 3 ice buckets full didn't make a dent in the temperature it I filled up a plastic bag and dumped that in. You could actually still see the ice floating as I took over (no there is no room in the ice tub for 2!) for my 15 minutes. So now we are just sitting around waiting to see how long it takes us to get tired. We have to get up at 3am so no matter how you look at it there is not a lot of sleep tonight. In less crazy news Disney have this wonderful thing called frozen coke which is like a slushy made of coke and its wonderful stuff... since they wouldn't let me take my precious Gatorade on the plane this will make a great replacement tomorrow. ...and then I do it all over again. 0.7 miles (warm up run) down 39.3 miles to go!!!! Taking the time difference into account I have a little over 3 days to go before I drag myself out of bed at 1am Seattle time to ride a bus to probably the craziest thing I have ever done. At 6am EST on Saturday I will be running the Disney World half marathon - 13.1 miles through Epcot and the Magic Kingdom. This will be my 5th half marathon and I regularly run more than 13 miles in training so even though many of you think this is crazy you probably are not that impressed. The really crazy part is that at 6am on Sunday (yes the day after!) I will also run the Disney World FULL marathon - 26.2 miles though all 4 Disney parks. This is called the goofy challenge - the name I think is pretty obvious. This will also be my 5th full marathon. That's a 2 day total of 39.3 miles but when you add in the 10 minute warm up jog I will do on Friday that should give me the extra 0.7 miles that I need to run 40 miles in 3 days. I figure that's as good a way or celebrating turning 40 as anything and jsut maybe it will undo some of the eating and drinking I did over the last few weeks. From my running group we also have one other Goofy person as well as J running her first half marathon and S running her first full marathon so it will be a weekend of firsts for everyone. I'm sure most of you reading this wonder what on earth would motivate someone to do this. I wish I could explain it - I've never been a sporty guy but even though I'm not going to ever be in contention for the medals there is something very motivating about challenging yourself to improve your times and distances. Its also very funny to tell people what you are doing and watch them spit their drink out in shock - especially people who I have not seen for a couple of years. I will admit to watching crazy long races like Iron Man/Eco Challenge on TV and thinking that it would be cool to do it but never did I ever imagine I would be fit enough to run a half marathon let alone 2 races back to back. And let me tell you the feeling as you see the finish line is something else! "You are more than friends, but not quite lovers!" Chris is in town for a 4 day code-a-thon but since I'm not an official part of the xna3way gang I just popped along to help out and record some choice bits of British dialog for their game. Since it was Chris's birthday we headed down to gameworks and what a sorry mess that has become. Seems like the home console market is hitting the last surviving big name arcade pretty bad. Half the machines are gone from my last visit, there is a whole room full of machines that print little photo stickers with anime chicks, several machines that are 100% in Japanese (though the drumming one was quite fun) and the bathrooms look like they have not been updated since 1963. Jason and Chris played "lets go jungle". Its a rail based shooting game where various big bugs and spiders attack you. One person plays the male lead and another the female lead - check the video out for the characters. Mostly a standard game but as you play I noticed that if they both managed to shoot the same thing a little heart appeared. Then at the end of the level you got the usual score screen where it totalled up the monsters you had killed and gave you a shot percentage but then up came their compatibility rating!! Yes while you shoot the rampaging bugs and watch your tour guides get turned into spider food you are somehow expected to sync up your shooting to see how compatible the characters are. Only in the crazy world of Japanese video game logic does the love/passion angle come into such a game. After level 1 Chris and Jason were 52 percent compatible and this meant they were "more than friends but not quite lovers". Interestingly enough after another half a level when they died they were up to 63% and "lovers but in name only" whatever the hell that means. I'm pretty glad I burned through my last points so I never have to return to that place. Jason burned through his points by proving to me that you CAN win on those claw games! He's quite the stud with those machines - probably because he spends so much time hanging around at Chuckie-Cheese - well until they got the restraining order anyway. About time I blogged about something other than running or ranting! In my many years at Microsoft I spoke to lots of different sized groups from 20 up to I think about 250 and those folk who have met me know that speaking in public isn't something that is too hard for me. During the Managed DirectX days I spoke at Seattle and Portland code camps about shaders to a small and confused audience and I did a slightly modified shader talk on MSDN too. So now that Managed DirectX is dead I have been trying to work out a way to get some more speaking opportunities with XNA and its not as easy as it sounds. Why talk at all? Well firstly I need some real XNA jobs in 2008 otherwise I have to go and be a web dev to pay my mortgage and getting my face and name out there is a good way to increase visibility and reputation. Secondly it helps keep my MVP status. Finally, I like to go to conferences and travel and as a small business with no money those things are often too expensive for me to do. If you are a SQL Server or Siliverlight community leader then its pretty simple to fit in because all the conferences have entire tracks devoted to you. Admittedly there is also a lot more competition but once you are established you will see the same folk at every conference. As long as you keep your talks refreshed with new material you can even reuse the talks at most conferences. For XNA Game Studio its much harder to find a slot. There is almost never a track so you have to fit into the Windows programming track. Don't forget you have to compete with the celebrity bloggers and book authors out there who get speaking slots and high ratings just because of who they are (though credit due - most are also very good speakers too). The next obstacle is that most conferences are populated by people who are there for business purposes and swinging XNA GS as a business tool is pushing things a bit far. It used to be that (Managed) DirectX was the only way to do 3d graphics so you could target a business talk with 'High performance 3d for your windows applications' but with WPF now available on XP and Vista you have to point people there first. Sure WPF perf isn't as good and its not as flexible - no shaders etc. But for most business apps that need 3d its perfectly adequate. I got my first big conference opportunity last month at DevTeach Vancouver. The initial contact came about because George had been contacted to speak and wasn't sure if he wanted to or not. They were having an XNA Game Development track as a bit of an experiment I think and I knew the track chair, Pat McGee, vaguely as I had talked to him about his XNA book. So I emailed and offered my services and I ended up doing 3 sessions alongside 3 from Shawn and 3 from Pat himself. The talks went very well and we all got great feedback but as I suspected most of the attendees were there on their company dime and though many of them told me they wanted to attend out talks over lunch and beers many of them chose the .Net 3.5/SQL/VS08 sessions instead because that was valuable to their jobs. So we had less than 10 people in each session. So now that I have one conference behind me I need to parlay that into some more. DevTeach Toronto is May 12th-16th and Tech*Ed is June 3rd-6th. The deadline for Tech*Ed talks was December 31st so I took a gamble and proposed some XNA sessions with a slant that I hope will interest the non game developers. There are several Microsoft APIs for presenting graphics. For most applications taking the simplest development approach is often enough to give the performance that you want. However for solutions where the graphical output is on the critical performance path or the output needs to be of a specific quality the choice can make the difference between selling your application or not. This talk looks at all of the common Microsoft drawing APIs and compares their abilities, limitations and which would be the most performant for your particular scenario. Most of the talk will concentrate on Windows Forms solutions but Silverlight will be discussed for web presentation and Xbox 360 solutions with the XNA Framework which is suitable for rolling booth demos. Game Development is not just about first person shooters - complex simulations and other 'serious' games are written using the same technology as your favourite Xbox titles. With the release of XNA Game Studio 2.0 the world of the game developer is open to managed developers and its simpler than ever. Learn how to write basic 3d real time graphics that are faster and more realistic than WPF graphics and use techniques from game programmers to enhance your simulations. See how to run the simulations on Windows and Xbox 360 - which may be a cheaper platform for your application. With the release of WPF 3d graphics are becoming more in demand than ever but moving from a 2d to a 3d mindset is a large leap for developers. Suddenly your high school math seems so far away. What are these transformations and why do you have to worry about different coordinate systems. Learn the basic concepts of 3d from the exciting world of video games. This year I didn't go out on New Years eve. 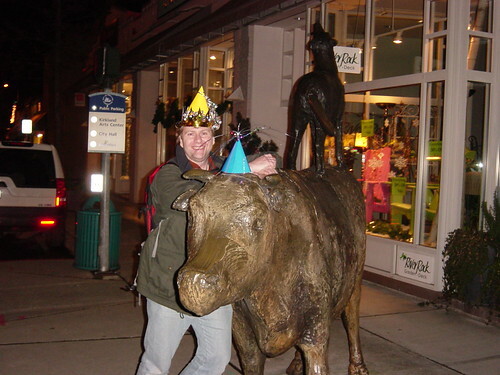 Now that I am old I can barely stay up till midnight let alone start partying then. So I rented a couple of movies. SuperBad and The Simpsons movie. Simpsons was actually better than I expected - its hard to take a 30 minute format and extend it to 90 minutes but they did a great job with lost of classic Simpsons moments. But SuperBad - well that was the other way round. I think they had enough material to make a hilarious 30 minute sitcom and they extended it by having the characters do some kind of adlib type dialog and swear a lot. I'm really not sure if they scripted every word or told the actors to pretend they were in some kind of high school reality show but it really annoyed my old man brain. The adlib type dialog might work in The Office but it was just annoying here. Oh for the record 'Knocked up' wasn't funny for similar reasons... I think this particular crew needs to go back to sitcoms where they were all very funny. Maybe hold off the movies for a few more years eh? Computer folk are not the most popular people in Seattle right now. Firstly we couldn't run buses through the specially made bus tunnel because of a computer glitch and then our New Year fireworks had to be set off using a manual process when the computer controlling it failed. Personally I thought the failed fireworks were quite funny... but then I had drunk lots of cider and some wine. Its not Christmas without Turkey for me so whilst I was very happy to get an invitation to Christmas I was a little disappointed that there would be no turkey unless I bought my own. 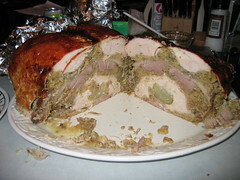 Well I have always wanted a TurDuckEn - too many years watching Food Network as well as an interest in odd foods. So J and I decided to make one. One thing you should know before you try - you end up with a LOT of meat. We had a 20lb turkey a 6lb duck and a 4lb chicken. Even without their bones I reckon we ended up with over 20lb of final product most of which is now in my freezer. Boning the chicken took a lot less time than I expected - I was done in under half an hour. It helps that this isn't for final presentation so you don't have to be tidy on the legs or wings. I was very proud of the small amount of meat left on the bones. J took almost an hour to do the duck. The backbones and leg joints were much harder to crack and cut and I didn't have any good shears. In addition the meat to bone ratio on a duck makes it much harder to do without going through the skin. The turkey was the easiest of the bunch not very fiddly and you leave the leg and wing bones in for final shape. Assembly was pretty easy up until the final stage. You layer stuffing and meat from the outside in and then you reshape the birds from the inside out. 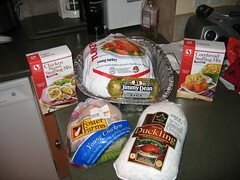 The chicken and duck went pretty easy but getting the turkey wrapped around the other 2 was a lot of work. It took 2 of us and about 5 skewers to finally hold it all together. The recipe said 3-4 hours cook time which I thought was horribly optimistic and I was right. We checked the internal temperature with 2 thermometers and it took around 5:15 to hit the right temperature at the chicken layer. The meat was insanely moist though... apparently cooking everything from the inside with pure duck fat is a good way to roast a turkey. I do not want to think about the calories though. It finally happened.. on December the 30th The Zman turned 40... sorry I didn't blog until now but I was a bit hung over as you can imagine. I am very happy to inform you all though that after some very careful research I have discovered that due to inflation 40 years old is no longer considered old. In fact you now have to be 52.78. With a bit of luck I will stay behind the inflationary trend and never actually be old. In honor of my birthday J put on a little geocaching treasure hunt for me which was fun. My family had sent embarrassing things like baby photos and school reports for the caches and of course the final treasure was our favourite local pub where all my friends and a cake were awaiting me.